The Poodle is most likely descended from early German water retrievers, but may also be related to spaniels from the Iberian Peninsula. The name probably derives from the German word “Pudel” (one who plays in the water). Hunters originally clipped the dog?۪s thick coat to help it swim, leaving hair on the leg joints to protect them from extreme cold and sharp reeds. The French capitalized on the breed?۪s high intelligence, trainability, and innate showmanship, using the Poodle as a circus performer. The breed?۪s great popularity in that country led to the common name, French Poodle. 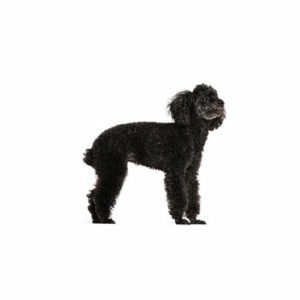 In France, however, the Poodle is called the “Caniche,” or duck dog. The Poodle has also been used to sniff out truffles lying underground in the woods. Poodles are depicted in 15th century paintings and in bas-reliefs from the 16th century. Toy Poodles became royal favorites, particularly in the 18th century. The Toy and Miniature Poodle varieties were bred down from the original larger dogs, now known as Standard Poodles. The three sizes are considered as one breed, and are judged by the same standard. Today, the Poodle is primarily a companion and show dog, though he can learn almost anything.